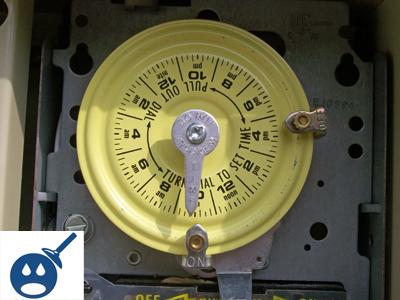 If your Intermatic swimming pool timer has stopped working you will have to do something called troubleshooting. There are many reasons why your pool timer may not be working. You could be missing the timer pins, you could have a bad timer, you could have no power to the timer or maybe even the timer is set wrong and it really is working but your not seeing it. So what you will need to do next is to troubleshoot your Intermatic timer with a few steps. Once you figure out what is wrong with the timer, you may be able to do the repair yourself or might have to hire an electrician to come and replace the timer for you. There are simply things you can do yourself like adjust the timer pins and set the clock on the timer. 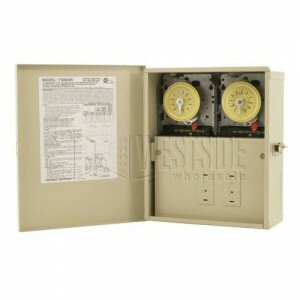 But of the timer itself is bad you will need a licensed electrician to change the timer for you. I mean you could go out and buy the timer for the electrician but you will need his experience to get it installed correctly. Okay, so let’s move on to the Intermatic Pool Timer troubleshooting and figure out why your timer is not working. 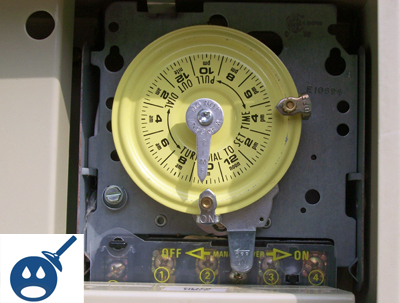 If you are not sure if your timer is working or not you will first need to know if its even operational. You will first want to look at the pool timer and see if you have two timer pins. There should be an off pin and an on pin. If you have both pins take notice of there position and then come back in a few hours and see if they have changed from the spot they were in when you last looked. Its best to just write down the spots each timer is in, but remember that it’s a 24 hours cycle so you will need to come back within 24 hours to see if the pins moved. If you have gone back after a few hours and the pins have moved that means you have electrical power to your timer and it is working. You most likely just need to now set the pins and the clock and your timer will work. See the next section in this article for that. If your timer pins have not moved that means there is no power to the timer or the timer has failed and need to be replaced or possible manual over ride switch for the timer is off. You will want to make sure the manual switch under the timer wheel is pushed to the on position. Another thing you will need to troubleshoot and check is the circuit breaker for your pool timer. So what you will want to do now is to look for the circuit breaker panel and locate the circuit breaker for your Intermatic Pool Timer and then make sure it is set to the on position. Commonly, many pool owners will think there pool timer is broken and not working when all they had to to is turn the circuit breaker to the on position. But if your circuit breaker is in the on position and your pool timer clock is not rotating and the timer is not working then you will need to call a licensed electrician to replace the timer. If the power has gone out, your just opening your swimming pool for the season or some third reason, you may need to adjust the time on your Intermatic swimming pool timer. To adjust the time you will first want to look for the “time” bar that is mounted in the middle of the timer wheel. Then number(time of day) that you line up with the time marker will be the time that you are setting your timer to. So if you see the 10am behind the “time” marker, this means that the timer has the current time of 10am. If you need to set the time, you will need to take two fingers and slightly pull the wheel towards you and away from the back of the timer box. You will feel the wheel pull out about an 1/8″ of an inch and then you will be able to rotate the timer wheel. Just turn the timer wheel until the correct time of the day is aligned with the timer marker that is mounted in front of the wheel. Once you have confirmed that you timer is working you will need to adjust the timer pins to reflect the time you want your filter system to turn on and off. You will first need to adjust the time on the timer first. Once you have the timer set to the correct time you then can loose the little hold down screw on both the timer on and timer off pins. You off course will want to adjust one time pin at a time. Also be careful not to loosen the timer pins to much or they could fall off the timer wheel and onto the ground. If you loosen the hold down screw to much it could separate from the timer pin. So just turn the adjustment hold down screw on the timer pin counter clockwise about a full turn and then you will be able to slide the on or off pin to the right time on the timer wheel. Once you do some you will want to re-tighten the hold down screw on the timer pin so it stays in place. My pool pump turns on but the dial is not moving. I set the time, pushed the dial back, and when I came back later the time did not change. Is my timer shot or is there a way to fix this? The timer goes on only if I turn it on manually; is there anything I can do to trouble shoot /reset ? I have an intermatic104P20. It turns on fine but won’t shut off. The off pins are bending each time it reaches shut off time. It also holds the timer wheel so that actual time is off before bending the pin enough to bypass it. My timer is set at the right time and the pins are set to go on and off. It doesnot go on but it does go off. What could be wrong? Please let me know how do you resolved this problem. Just started having the same problem with a little bit of a twist. At certain places on the dial, my ON tripper works but at places it does not work. The situation is repeatable even with a new ON Tripper. Do not see where the timer face plate is warped/distorted. I’m baffled. Next step is to replace the timer and then disassemble to see if I can find what’s going on. We have a similar looking timer for our parking lot lights. The problem we’re having recently is, the timer shuts off about 5am every day and the circuit breaker trips also. I’m able to reset everything in the morning when I get into work and it works fine all day, til about 5am the next morning. I don’t see any obstruction or anything that could cause extra resistance. Please advise. My cleaner comes on when my pool comes in but I have it set to come on later. Unusual problem: CLOCK APPEARS OPERATIVE BUT IS NOT PROVIDING POWER TO POOL MOTOR AND WHEN MANUALLY operated — THE ON/OFF ROCKER ARM IS SWITCHED TO ON – NO POWER IS SUPPLIER TO POOL MOTOR. Clock has power(can hear clock ticking) & dial is turning and the on/off rocker arm is being activated on/off – HOWEVER, IT IS NOT TURNING ON OR PROVIDING POWER TO MY MOTOR. Also when manually operating the on/off rocker arm FAILS TO TURN ON OR POWER to the POOL MOTOR. This has occurred after the electrical line feeding to the clock threw the circuit breaker. After resettng circuit breaker the clock is running but not providing any power to equipment. My intermatic makes a buzzing sound and doesn’t work when I turn it on. Any idea what this is? I have the Intermatic T10004RT1 Time Switch with Transformer. The timer is working, the dial is turning and everything appears to be working as it should. When it gets to the set start time, the manual switch is moved but isn’t moved completely to the point where the pump kicks on. If I nudge the manual switch, it turns the pump on fine. The pump cuts off at the designated time. Could this be that the transformer is faulty, not providing enough power to trip the switch?